I have some very odd memories of my time at University. I also have a vast number of happy memories and a fair few sad ones too. In fact, is that not just a bit like life for many of us? Indeed, I think it is. We all have had our fair share of odd, sad and happy memories that have had their impact on us. Having experiences like this is what helps inform the way we live as adults in society. However, for many people, going to university may well be their first chance to lead a somewhat independent life. Away for the watches of their parents and guardians, students get up to all kinds of things that would be very difficult to do if one was still living under the control of their mum and dad. Thus far I have studied in two very different university cities. Oxford, and Leeds. Don’t tell my southern friends but Leeds is by far the better city! Although Oxford has offered the more, err, bazar experiences. Of those that are safe to mention in a pulpit, that one that suddenly came back to me this morning was certainly one of the oddest. One morning I woke up to a strange but familiar noise. As I gathered my senses I began to realise what it was. It was a sound far more likely to be heard from my old school in rural Sussex rather than coming from a quad of an Oxford college. Fortunately, as my window in halls looked out on the quad, I did not have to wait long to confirm my suspicions. There in the quad, looking very puzzled were some of my fellow undergraduates. More precisely they were looking very puzzled at a sheep that was looking even more puzzled as it strode around the college grounds bleating away like it owned the place! I have no idea how it got there to this day. Leeds by comparison has been a little tamer in terms of experiences. Although the change did take some getting used to. When I first arrived up here to study for an MA in Theology I came up on the train by myself carrying everything that I could fit into one suitcase. I arrived at the Unipol accommodation offices and they gave me a key for a flat I had never seen before. Fortunately, I lucked out. The place was huge. It was also very empty and, to make matters worse, it was soon evident that the practice of employing a person with the responsibility of making sure there were adequate tea and coffee making supplies in students’ rooms was very much an ‘exclusive to Oxford’ thing and not as universal as I had expected. So, mission one of my first day of actual (non-Oxbridge) independence was to make a cup of tea. I went into town and brought everything I needed for myself. Adulting was going well so far. Then I got the stuff home, again so far so good. It was only when I got home and put the new kettle on when I realised something. I had got tea, sugar, milk, a kettle, even tea spoons. Yet I had forgotten one thing: The mug. Although maybe because I arrived to do a MA and could not even manage to make a cup of tea for myself on the first day of arriving in Leeds, maybe I was the mug in this situation all along! We all make mistakes during our first stages of independence. This this is true of the Israelites too. The book of numbers is, even by Old Testament standards, amazingly wired. It cannot even keep to one genera of literature. It contains lists, itineraries, statutes, details of rituals and priestly duties, poetic oracles, songs, stories, and even a very well-known benediction that I’ve pinched for use in this service later. When we joined the Israelites in our reading today, they were complaining. Why had God delivered them for slavery in Egypt only to being them out into the middle of a desert were there was not much in the way of tasty strength building grub to eat. Many are thinking that they might as well have stayed in slavery in Egypt and many are openly grumbling to others. This irritates God big time and he tells Moses this in no uncertain terms that he is not happy. Moses responds by snapping back at God. He claims that God is negligent for leaving Moses alone in charge of the wellbeing of so many hungry people and makes it very clear that he cannot continue in the task God has given him in its current arrangement. God responds in two ways. Firstly, as we heard in the reading, he agrees with Moses that God’s spirit should be carried by more than one person. But also he tells Moses that the Israelites will get their meat and, because God is clearly still mad at them, that they will get a whole months’ worth. In fact, they will get so much that they will get so much that they will find it loathsome. God delivers on both these promises. He places his Spirit (ruah, in Hebrew) on the Elders. However, he also delivers a wind (another translation of the word ruah), that blows a whole flock of quail into the Israelites camp. We are talking so much quail that the bodies of the birds surround the camp for miles and burry it 3 feet deep. I tend to imagine something resembling an explosion in the stockroom of the world’s poshest KFC! However, before they could eat them all a plague (one things maybe a form of bird flu caused by wading through 3 feet of dead birds for two days) breaks out in the camp. Now this be a passage of the Hebrew Bible that some might find a tad off-putting. Had these former slaves not already suffered enough without having to deal with a God that sends a plague just because they wanted a bit of variety in their diet? Maybe this is true. The Bible can be very dark in places. But it is so for a reason. It is a collection of books that deals with how people experience God and the world around them. How could a book that deals with that be all light a fluffy when life is not all light and fluffy? Numbers deals with people who are trying to get to grips with what it means to be an independent people. They are trying to decide what is allowed and what is not? Who is in and who is out? How do we agust to living a completely different life? How do we deal with this God thing that has suddenly showed up? How do you even cook a quail? When people are in a situation of discovering their independence, like all those freshers who find themselves in Leeds this week, you will go through dark times, you will go through happy times, and you will go through times that are just very odd. The Israelites had Moses and a team of elders. They did not have all the answers, but they had people who would listen. 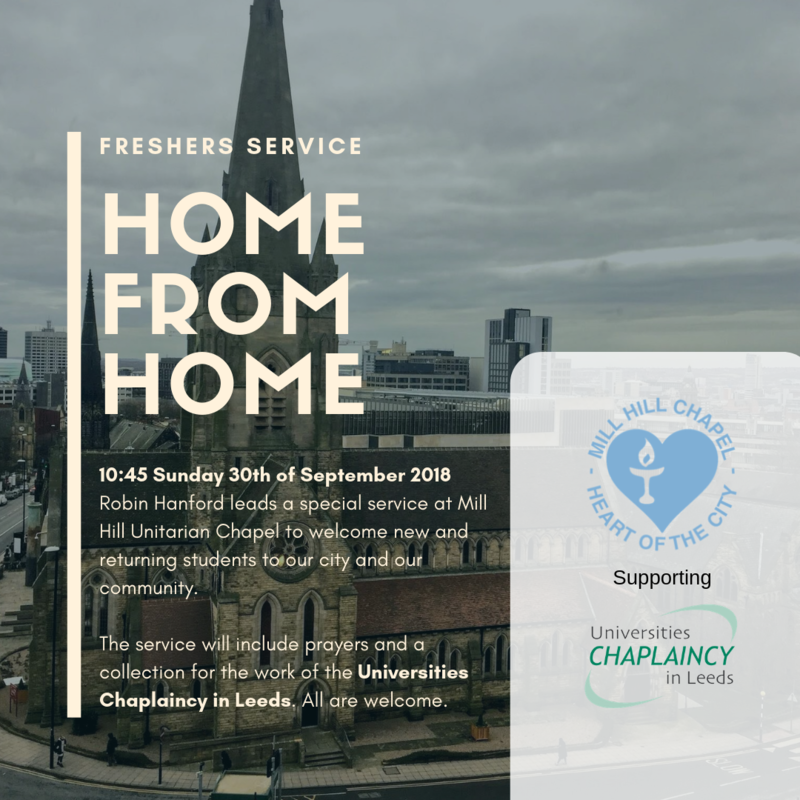 Freshers’ have the Universities Chaplaincy in Leeds. The Chaplaincy doesn’t have all the answers but it dose have people who will listen. It also has tea and coffee supplies available for a suggested donation of 30p! I wish I had known that sooner!